Speaking of watermelons, Mark Twain wrote: "It is chief of this world's luxuries, king by the grace of God over all the fruits of the earth. When one has tasted it, he knows what the angels eat." Later, he affirms that it could not have been a watermelon that Eve ate in the Garden of Eden: "...because she repented." There is little on this earth as unrepentantly delicious as a fresh slice of watermelon, and the craze for pairing it with a strong cheese like Feta in salads is in full swing this summer. We wanted, however, to make this on trend dish a main course for four, so we added delicious grilled chicken and a balsamic reduction for a flavor combination that will knock your socks off. Even better, pair it with our 2012 Terra Alta Vineyard Viognier, which is light enough on its feet for the hottest of summer days, yet complex enough in its mingling of white flower and honeysuckle to stand up to the richness of these strong flavors. Pour the balsamic vinegar into a small saucepan and, over medium-high heat, bring to a boil. Reduce heat to medium-low and simmer for 15-25 minutes until the balsamic vinegar is significantly reduced and starting to become syrupy; you can use the back of your spoon to test. Meanwhile, heat a clean grill pan (or if you have one, your outdoor grill, oiled and cleaned) over high heat until the pan is screaming hot, at least ten minutes (for an outdoor grill, a medium-high fire will prevent the chicken drying too quickly). Pound the breasts in a sealed plastic bag until an even 3/4" thickness throughout, then season with your spice mixture and drizzle with olive oil. For chefs with a hair more time, you'll get the juiciest breasts if you throw them in salted water for 30 minutes after pounding and before seasoning; if you go this route, lightly rinse the breasts after removing them from the brine and omit the salt from the seasoning of the chicken. Coat the surface of your hot grill pan with cooking spray (it will begin to smoke immediately) to aid in removing the chicken later. Cook the chicken through, flipping only once to keep the integrity of your grill marks. Timing on this will vary with the thickness of your chicken breasts and the heat of your pan, perhaps 3 minutes per side, but you can test the doneness with either a meat thermometer (160 degrees... as the meat rests it'll reach 165, which the FDA recommends, although a juicier breast can be removed at 150 with no unhealthful effects), by cutting into the breasts until the juice runs clear, not pink (you will lose some juiciness with this method), or for the advanced chef, by using the thumb-middle finger "firmness" test. Once removing the chicken from the pan, let it rest for five minutes, then cut into small cubes. 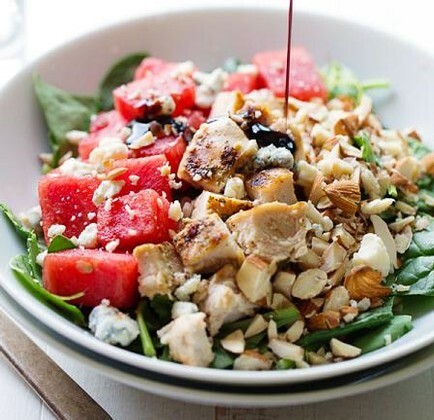 In a large bowl, layer the spinach with the chicken, watermelon, bleu cheese, and almonds, and drizzle with the balsamic reduction. Top with additional olive oil if desired. Then open a bottle of Von Holt Wines' 2014 Terra Alta Vineyard Viognier, and enjoy the fruits of your labor with the fruits of ours.